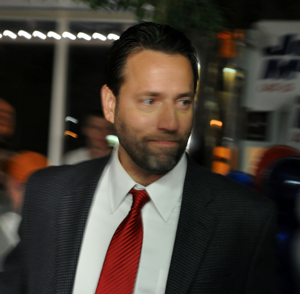 Joe Miller defied polls and pundits’ expectations with his strong showing at the voting booth Tuesday. In the two days since, he’s been deluged with media requests not just in Alaska but from around the country as people outside try to learn more about who Miller is. He’s now back in his home of Fairbanks for a few days as his campaign awaits next week’s new vote count. Miller told APRN’s Libby Casey that while he’s not ready to declare victory, he is optimistic. Photo by Josh Edge, APRN – Anchorage: Candidate Joe Miller enters the Egan Center on primary election night on August 24.